Inequality is so stark that a small group of men own the same wealth as half the world, say campaigners ahead of the high-profile World Economic Forum in Davos. According to research by Oxfam, the eight billionaires, including Bill Gates who tops the list, have riches equivalent to the wealth of the world's 3.6 billion poorest people. The gap (Frankfurt: 863533 - news) between rich and poor was far greater than feared, and the charity has called for an overhaul of a "warped" economy that allows one in nine people to go hungry. Theresa May and Philip Hammond will attend the World Economic Forum in Switzerland this week. Critics of the annual event, held in the luxury Swiss ski resort, say it is little more than a talking shop for the rich and powerful. Oxfam has called on leaders to improve international cooperation to stop tax dodging, action to encourage companies to act for the benefit of staff as well as shareholders, wealth taxes to fund healthcare, education and job creation, and improvements in opportunities for women. It is also urging business chiefs to commit to paying a living wage and their fair share of tax. Mark Goldring, Oxfam GB chief executive, said: "This year's snapshot of inequality is clearer, more accurate and more shocking than ever before. "While one in nine people on the planet will go to bed hungry tonight, a small handful of billionaires have so much wealth they would need several lifetimes to spend it." Oxfam said out-of-control pay ratios meant the average pay of FTSE 100 chief executives was 129 times that of the average employee and works out at the equivalent of 10,000 people working in Bangladeshi garment factories. New (KOSDAQ: 160550.KQ - news) and better data on the distribution of global wealth, particularly in India and China, showed the poorest had less wealth than previously thought, the charity said. 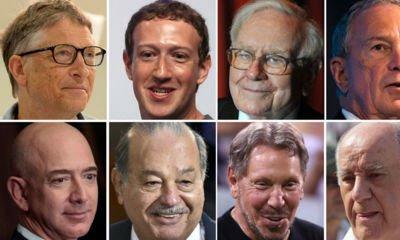 The eight billionaires named in the report are Microsoft (Euronext: MSF.NX - news) founder Mr Gates, who has a personal fortune of $75bn according to Forbes; Inditex founder Amancio Ortega ($67bn), veteran investor Warren Buffett ($60.8bn) Mexico's Carlos Slim ($50bn), Amazon boss Jeff Bezos ($45.2bn), Facebook (NasdaqGS: FB - news) 's Mark Zuckerberg ($44.6bn), Oracle (NYSE: ORCL - news) 's Larry Ellison ($43.6bn) and former New York City mayor Michael Bloomberg ($40bn). Many of those in the report have also given billions to charity.